The yeti-bar was opened not far away of Siberian city Kemerovo. The small settlement Shergesh is situated on the Green mountain peak. Restaurant keepers think tourists, locals and… snowmen will visit their café often. 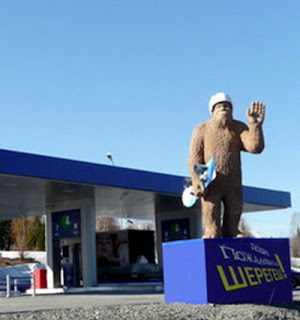 The yeti is a relict hominid supposedly living in the Kemerovo region and is considered a main tourist attraction of this miner’s region. Last year Kuznetsk Basin’s citizens even began to celebrate the Yeti Day initiated by the governor Aman Tuleev. Some specialists (for example, from the International Hominology Centre) think about 30 snowmen live in these mountains. Last six years the number or tourist visiting Mountain Shoriya increased from 42 000 to 300 000 people. 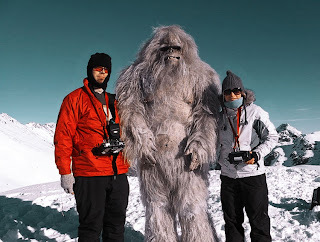 “Some tourists go here especially to find the yeti but we don’t think up anything especial for it. There are real evidences of the Shoriya hunters, huge steps are plastered” officials say. Four scientific expeditions have already been in these mountains. Generally the yeti cult is very popular here, there are a lot of snowmen’ sculptures: near cafés, petrol stations, on squares and in parks. Yeti-bar’s organizers hope not only snowmen will visit the café because they’re insolvent. But the Mountain Shoriya’s locals and guests – you’re welcome! Here you can taste traditional Shorian cocktails and drinks, and also “Arochka” like Russian vodka. The café is too popular because is situated on the territory of the ski resort “Sheregesh”. In spite of beastly cold here the resort was visited by more than 85 000 people during only New Year vacations. The resort’s development continues always. There are more 42 hotels, 49 cafés and restaurants, 4 entertainment centers. Thanks to the yeti and legends about it this Siberian region is very famous in Russia and near abroad.